“Da,” Stephan confirmed to Hasan, “Let’s go see what that wailing was.” He nodded toward the left, up and behind where the two tunnels opened. After getting his gear in order, he opted to have his bow ready at this time–He paused, waiting for Hasan and Ludo to lead the party toward where the wailing was heard. Ludo finished wiping the rat blood and fur off his sword, and nodded to Stephen. “We haven’t finished investigating this tunnel which is where the ghouls disappeared into. I suggest we re-enter this tunnel and finish off these unholy creatures first before investigating the wailing sound.” Ludo looked at Maruc for confirmation as to what he thought was the best course of action. Feldard shook his head at the lack of clear leadership amongst the party. Well it was his fault he supposed, he asked the question of where to go, in the first place rather than simply leading the way. Best he solve it then. With a grunt, he reloaded his crossbow and he nodded to Ludo. “We continue back into the tunnel.” The dwarf didn’t wait to see if others agreed or not. He simply led the way into the tunnel mouth once more. Ludo nodded to Feldard comments, moved aside to let Feldard into the cave and relit the torch he was holding. He shurgged his shoulders it least if the Ghouls attacked; chances were he would not be within range of their putrid claws and paralysing touch. He murmured to himself, “I hate fighting undead.” Holding the torch aloft, he followed the last party member into the cave. “Oh wise Feldard we shall follow you, if only to pull your paralyzed corpse back out.” Maruc’s mischievous grin hovered around his lips as he slapped the dwarf on the shoulder. “Fear not the power of Halav goes with us.” He ducking into the cave after the dwarf, holy symbol and lightstone in one hand, mace in the other. There was no guarantee that the two ghouls they had seen were the only ones. Stephan shrugged and stowed his bow. Figuring they’d be in tight quarters for a spell, he fitted his shield on his back and readied his sword and lightstone. With stalwart determinism, he took his place in the line up and entered the grotto. They encountered a few straggler rats that hadn’t gotten caught in the mage’s sleep spell, but they were easily disposed. Feldard led them a short way until they reached an area where the tunnel opened up into a larger area. This larger chamber was more fit for human-sized creatures, with about an eight feet high ceiling. There were openings to other small tunnels. It appeared that this was the center of some sort of underground ghoul tunnel system. The ghouls that had fled at Maruc’s banishment were hiding inside. They shrieked at the approach of the group and once again attacked. Miklos wasn’t about to be caught out a second time, he had expect this and had prepared his web incantation. As the burly dwarf and and bulky armoured cleric parted to make room to defend themselves Miklos took advantage of the gap and cast his web between them at the ghouls. Maruc sprung right and raised his mace and symbol. “Cower before the Hand of Halav!” he cried using the power of is God again. Within the eerily glowing illumination cast by the flickering torch light the ghouls looked liked creatures from Ludo’s nightmares, he held his sword in the guard position prepared to defend himself and watched as the magical web encased the unholy shrieking creatures, trapping them. Though they struggled within the web strands they quickly fell under the sword and axe blows from Feldard and Hasan. Ludo wondered how they came to be here and who was their master, the very presence of these creatures indicated that the ‘Sons of Nights’ might be active in these parts. Perhaps the mysterious waling sound from outside the cave would answer that question. Once the creatures had been despatched Ludo searched the cave for any clues or anything of value. Feldard was glad for the greater height of the cavern. Here he could swing his axe with much more effectiveness. As the ghouls became entangled in the webbing cast by Miklos, Feldard went to work, cleaving the undead til all that remained were parts. Initially, Stephan took up a position to protect Maruc and Miklos so they could ply their trade. 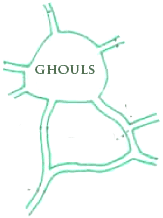 In the aftermath, he followed Feldard’s and Ludo’s lead and assisted in piece-mealing the ghouls. Trying not to shine his lightstone so as to disrupt the demi-humans’ vision, he too inspected the cavern and tunnel exits. Last into the room, Hasan saw little but the efficient dispatch of the horrid ghouls. His elven hands worried over an arrow, halfdrawn from the holster that hung by his side. But the elf saw no target. He watched.